View All of the events. Athletic and activity meeting, practice & game times. Sign up to receive alerts. Award-winning student newspaper featuring news, sports, entertainment & more. T-Shirts, hoodies, warm-ups, hats & more. Your one stop shop for spirit wear. We're proud of our state-of-the-art addition. Come see why. Mundelein High School is dedicated to academic excellence for all learners through the core values of equity, growth, and collaboration. 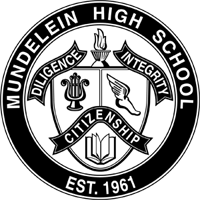 Our vision at Mundelein High School is to create a nationally recognized high school that provides multiple opportunities for all our diverse learners to visualize their potential futures and for each to realize a pathway to continued learning, productive citizenship, and personal success. Website Publicity Statement: While we are very proud and supportive of our students’ many accomplishments, we only publicize those that take place within school-sponsored activities. We appreciate your understanding in this regard.